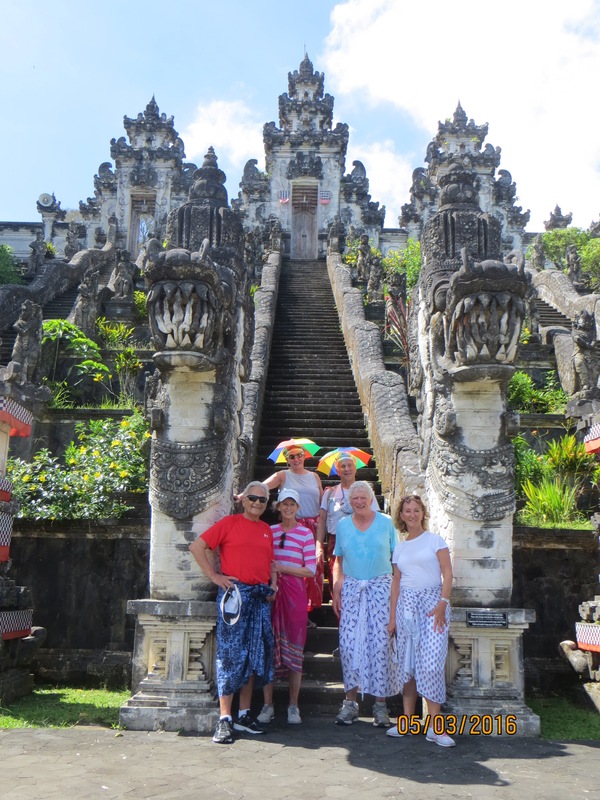 We rented a house in Bali with friends for a week and agreed to meet at the airport in Bali on May 1. We had stopped in Singapore for a couple of nights to visit friends and Carl had not been to Singpaore for years so we booked at The Fullerton Bay Hotel. This is the only hotel on the water with a lovely view of the huge Ferris wheel and looking out toward the Gardens by the Bay. The next day we got up early and did a grand tour of the gardens. I have been several times before, but I am always amazed by the changes in the indoor displays and the lush growth of the outdoor gardens. It was very humid so go early and dress for the heat and all the walking. We went back to the hotel and changed to meet our friends for lunch at Imperial Treasure restaurant where they serve the best Peking duck in the city, located on the top floor of Takashimaya shopping center. After lunch you should go to the basement, it is always fun to see all the food stalls and walk through the area where they sell the beautiful packaged candy and cookies. The shopping in each of the many shopping centers along Orchard Street is the best in the world, something for everyone. Back to the hotel for a swim in the roof top pool and a nap to fight the jet lag. One of the things I love in Singapore are the chili crabs and we made reservations at Tung Lok Signatures for dinner with friends and shared the chili crabs and the local long razor clams prepared with garlic and a light soy sauce, delicious. The next day we walked a couple of blocks to the National Gallery to tour the exibit and just wander through the newly restored building. We were there for a couple of hours and could have spent more time, but we had a plane to catch. We were met at the airport by our friends and our host for the next week in the small village of Amed, Bunutan. After a 2 hour drive we arrived in the seaside village of Amed. 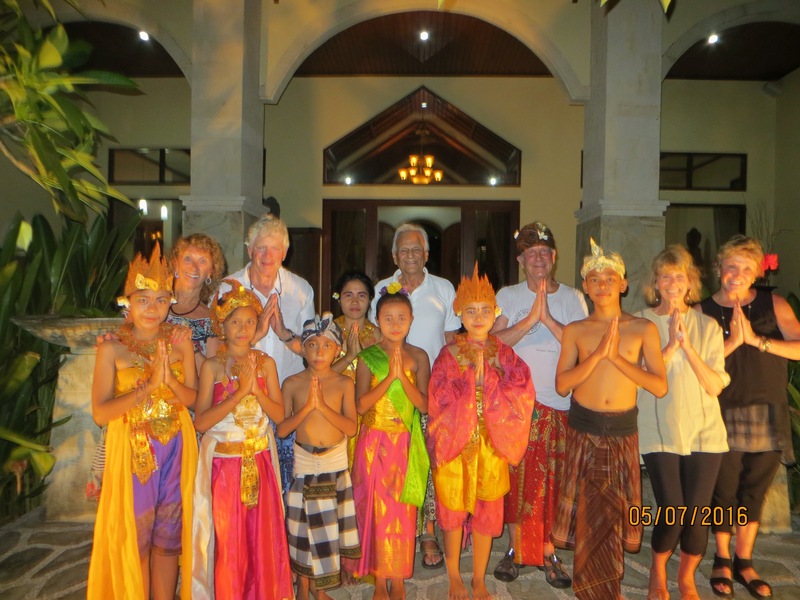 We were staying in the lovely Villa Pantai, owned by Scott Swingle. The house is managed by a wonderful young couple Made and Kari and they got us settled into our rooms and ushered out to the lovely pool under the palm trees. The house has 4 large bedrooms all with bathrooms, large living areas and the big outdoor dining area where breakfast was served each morning. Amed is like going back in time, most of the people come here for the diving and wonderful snorkeling. A ten minute drive in either direction from the house and you are on a black sand beach with wonderful coral and fish waiting for you to swim among them. You can rent fins if you do not want to bring your own, plus for a couple dollars they have nice chaise lounges with umbrellas to rent. The water is very warm so you tend to not want to do anything but swim and sit under the umbrella and read or sleep. The two beaches we swam off both had nice little places to eat lunch and have drinks. We would go back to the house for the afternoon and most days some of us would have a massage, $15 for an hour massage under the trees. We would walk to dinner at one of the small local restaurants the best was The Griya, they also have a lovely hotel on the hillside overlooking the sea. There was a little grill with fresh fish and local noodle dishes. Don’t order beef, it was very tough, better to stick with the pork or chicken. One night we went to the Crispy Duck and had their duck special. They only had two bottles of wine so we drank both of them after trying their margaritas. Glad we were walking home. We did make one morning trip to Lempuyqng Temples, we only hiked 2 of the 7 temples and almost died along the hike hundreds of steps in very hot temperatures with 100% humidity. We stopped by The Water Palace on the way home, it had been the home of the royal family. That evening our host prepared a lovely dinner around the pool for us. The last day we just ate lunch next door at Tirta Gangga, bought ice cream bars across the street at the little grocer and that evening they prepared a true Balinees dinner and the local kids did several traditional dances in true local costumes.We realized that all you needed to bring was a swimsuit, shorts, t shirts and flip flops. They were happy to do laundry and if you wore more than shorts or a sorong you were to hot. After a wonderful restful week Made drove us to Ubud, about 3 hour drive since the roads are narrow and the traffic moves slowly. We checked into a beautiful new small hotel called The Goya. This lovely hotel sits above the rice fields and when you are at the pool you look out over the canyon and jungle. The hotel is less than a year old and still has not got the spa up and running, however they will offer services in the villa. We rented one of the Villas with our own pool and outdoor sitting area. Their restaurant is open air with beautiful chandlers hanging from the vaulted ceiling, we had dinner here the first night and enjoyed a nice menu with excellent service. They did not have a license to serve wine yet so we had to go to the wine store and bring our own. We did a long walk through the busy town and followed the crowd to the cemetery where a once in a life time experience of seeing a cremation taking place. The grandson of the King had died, age 34, and the family was having a public ceremony. 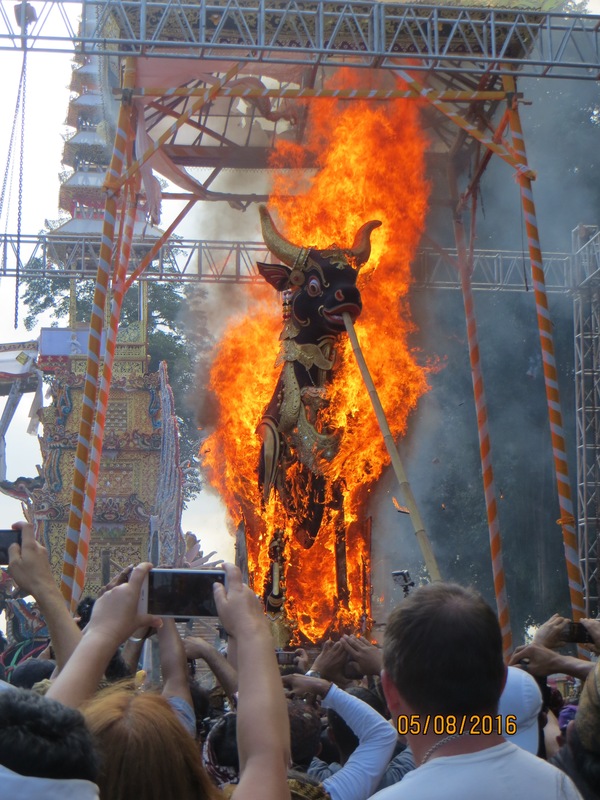 They would place his body in the center of a 3 story high bull made out of paper mache after many prayer and offerings were given the large structure was set on fire. Amazing! On the way back to the hotel we stopped at a small bistro on the Main Street called “Coco’s Bistro” we needed something cold drink , they suggested a fresh mint infused with sparkling water and lime juice. Time to reflect on what we had just experienced. The next morning we walked to the monkey forest, because it is the thing to do when visiting Ubud. Stopped for coffee and went back to the hotel for a short rest. We had read rave reviews about a place called “LUXE Cafe”, since you can only drive half way we had the hotel take us to the drop off point for our walk through the rice fields. After about a 20 minute walk on a path we arrived at the beautiful small hotel called The Luxe. They only have 4 rooms and a large suite for rent, but one of the best restaurants in town. We were greeted by the owner, Paul as we arrived and he guided us up the stairs to the dining room. The menu for lunch offered several kinds of the best burgers you will ever eat. Their home made buns, hand cut fries and simple salads were all delicious. After we finished with a sip of limoncello we headed home. They offered a couple of the group rides back into town on a moped since it had started to rain and the rest of us ventured out to walk the well know trail through the rice fields. It was a historical trail with several yoga retreats, artists studios along the way and plenty of muddy paths to manouver for about 3 miles, but worth the experience. Since this was our last night we took a well deserved swim and rest before heading out to dinner at Locavore. LOCAVORE-UBUD.COM. This is a very special evening and the food is so interesting. Your menu offers either a 5 course or 7 course meal and you choose between a vegetable or meat/ fish menu. The chefs work together to prepare small tastes of unique preparation of local ingredients. Plus they send several different small tastes to get you started, here presentation plays a major roll as each dish is served. When the menu read watermelon tartar it was thinly sliced watermelon radishes each sliced placed to resemble a petal on a flower and dressed with a hint of acid and herbs. Each course was more unique than the last with the main course on the meat menu a thin piece of pork belly crisp and moist all at the same time. We left the next day, spent the night in the hotel in terminal 1 at the Singapore airport since we had a 6am flight home. We took a cab into town for one last meal with our friends at LONG BEACH KING SEAFOOD along Manhattan road, we had to have the last black pepper crab and a good bye to Singapore.